Saturday & Sunday: 10:00 a.m.-6:00 p.m. Please feel free to contact us for any of your information needs through the contact information in the "Need Help? Ask us!" boxes at the right of each page. We wish you the best of luck with your research and studies! 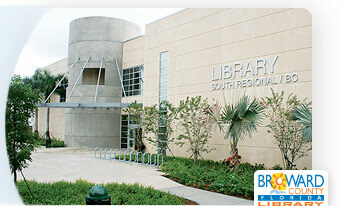 The original Broward College (BC)/South Regional Library was known as South County Library and was located at 441 and Johnson Street inside an old A&P Supermarket. 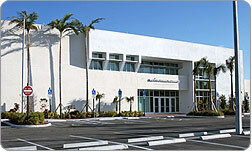 In 1983, the collections of both the South County Library and the then Broward Community College (BCC) Library were merged to create the first joint-use library in Broward County for the college community and the general public. The BCC/South Regional Library was funded by the State of Florida Community Education Facilitates Act and the 1978 Library Bond Issue. 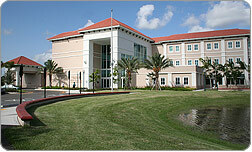 The now BC (Broward College)/South Regional Library serves the southern communities of Broward County, as well as the faculty, students, and staff of Broward College’s Judson A. Samuels (South) Campus. The groundbreaking ceremony for a new BC/South Regional Library was held on May 12, 2005. 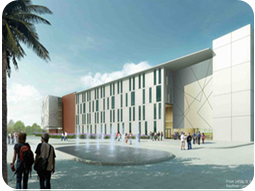 The new two-story, 70,000 square foot building was part of the $139.9 million Library Bond Issue Project approved by Broward County voters on March 9, 1999. The new library building opened on February 1, 2007, and is environmentally conscious, following the guidelines of the Leadership in Energy and Environmental Design (LEED) Green Building System, which was developed by the U.S. Green Building Council. 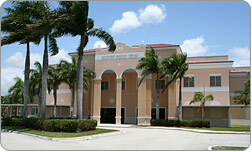 The Miramar West Center is served by Broward County's Southwest Regional Library. Thursday- Sunday: 10:00 a.m.-6:00 p.m. The BC Pines Center is served by Broward County's Southwest Regional Library. Thursday- Saturday: 10:00 a.m.-6:00 p.m.
Join us for our open office hours college-wide! Click on the flyer below for dates, times, and locations.